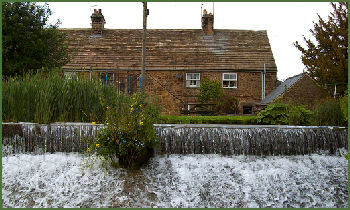 Rowsley is situated between Bakewell and Matlock in the White Peak, at the point where the River Wye flows into the River Derwent. 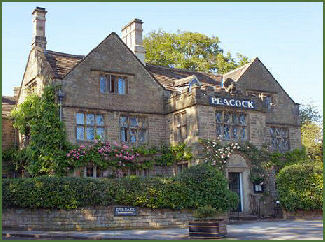 The characterful Peacock Hotel, was built in 1652 as a manor house by John Stevenson of Elton, agent to Lady Manners, the hotel derives its name from the Manners family crest of a peacock. The village was once owned by the owners of Haddon Hall, the Vernon family and later the Manners family, Dukes of Rutland. American poet Henry Wadsworth Longfellow and British artist Sir Edwin Henry Landseer are said to have stayed at the hotel in the nineteenth century. The stables at the back of the building date to the latter part of the seventeenth century. The Peacock is famed for its seven miles of fly fishing on the Rivers Wye and Derwent and offers luxury accommodation and an a la carte menu. Rowsley's other hotel, the quaintly named Grouse and Claret, was once known as the Station Hotel. It was built in 1849 after the arrival of the railway in the village. Ivy House, which stands opposite The Peacock was built in 1651. Other buildings of interest at Rowsley are The Beeches and Holly House, which were built as one house in 1710. This was the home of Sir Francis Darwin but was later divided to form two dwellings. The village fountain dates from the latter part of the nineteenth century and is the work of Trevis Bath. The oldest surviving structure in Rowsley is the old stone bridge over the River Derwent, a fifteenth century packhorse bridge, which was widened in 1925. The village Church of St Katherine was built in 1855 and contains the tomb chest of Lady Catherine Manners, the first wife of the 7th Duke of Rutland, who died in 1859. The railway station was designed by Joseph Paxton in 1849 and was often used by King Edward VII during his visits to Chatsworth House where he often stayed as a guest of the Duke of Devonshire. Caudwell's Mill, set on the River Wye, was founded by John Caudwell in 1874, a mill has occupied the site for over 400 years. It the only surviving complete water-turbine powered flour mill in England and still produces wholemeal flour for sale to the public. The mill is a complete fascinating automatic ‘machine’ on four floors and usually runs daily. Most of the machinery is earlier than 1914 and is still driven by belts and pulleys from line shafts. Elevators and Archimedean screws abound. The wheat enters the first roller mill, then the “grist” produced is “elevated” to the top floor where it enters the first plansifter. From there the graded product is passed to more roller mills and the process continued. There are numerous displays, descriptions and hands-on models throughout the mill to make your visit enjoyable and informative. There is also a Country Parlour Cafe and a craft centre with workshops including glass blowing, wood turning, furniture restoration and a Blacksmiths. Haddon Hall is an architectural gem. Dating back to the eleventh century, the hall has been described as "the most complete and most interesting house of [its] period", it is the finest example of a medieval manor house currently in existence in England. Stanton Moor an upland area rich in prehistoric remains situated between between Matlock and Bakewell. Lathkill Dale, a Peak District beauty spot in the truest sense of the word, is one of Britain's finest limestone valleys, it is situated about 3 miles from Bakewell. Arbor Low, sometimes referred to as ‘The Stonehenge of the North' is a prehistoric site of unique archaeological and cultural interest.